Words by Kevin Doocey on October 1, 2009 . If it’s not very common at Newcastle, that players score on their home debut but Marlon Harewood did just that against Queens Park Rangers last night. Although we rued the chance to go five points clear at the top, the main thing is, the lads got something out of the game. It was a game that you just thought it was going to one of those nights. However, to say we were lucky isn’t even a joke. We should’ve really wrapped that game up by 60mins but poor shooting and poor composure let us down in the end. Luckily our new lad Marlon Harewood, nabbed the equaliser. 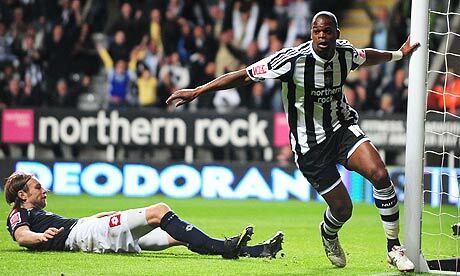 The main thing is, is that Harewood who has many critics, is giving it his all for Newcastle United. Yesterday he showed a few glimpses of what he is capable of and scoring goals is one of them. He’s a very determined guy and that’ll pay dividend at Newcastle. The fans love nothing more than seeing a player in the Black and White trying their utmost even if it’s in vain. Hopefully come May it won’t have been in vain. The takeover is yet to completed too and who knows, come January we might have Alan Shearer, and a few new players to aid our cause. Jonas Gutierrez also returned last night and looked sharp on occasions. Bristol City are our next opponents and we can’t underestimate them. Tyne Time’s prediction yesterday wasn’t too accurate but perhaps it should’ve been the real score line.